Beautiful heart-shaped garnet gemstones set in clover fashion in 14k white gold for a total of 3.50 carats of garnet gemstones! 14k white gold chain, included. Available with matching heart-shaped garnet earrings, shown below. Pendant Measurements: 9/16" x 9/16" (14mm). Pendant measures 24.5mm tall including bale (just under 1"). 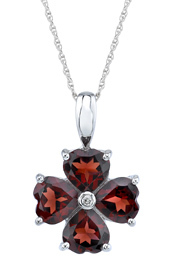 We guarantee our Garnet Heart Clover Pendant in 14K White Gold to be high quality, authentic jewelry, as described above.